Betfair Australia is definitely a five-star betting exchange. There’s every reason to get you over to Betfair right now but there are a few issues such as that mostly beginners might find uncomfortable such as high minimum bets. We wouldn’t say that Betfair has the best website as it might seem too overwhelming not just for beginners but for any users who’s used to a bookmaker’s format. Betfair does seem to have a higher commission rate in-comparison to other betting exchanges but quality service comes with a price. 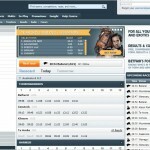 Betfair Australia has certainly set a standard of excellence for Australian Betting exchanges. A huge range of Australian specific markets are available in Betfair where Aussies can place deals against others creating a user friendly environment for Aussie punters. To help you learn more about what Betfair has to offer the punter, we have put together a review for Betfair Australia to help you better understand Betfair. Established in 1999 and providing theironline service since 2000, Betfair is the world’s leading online betting exchange. Betfair revolutionised the industry by enabling gamblers to directly bet amongst themselves. 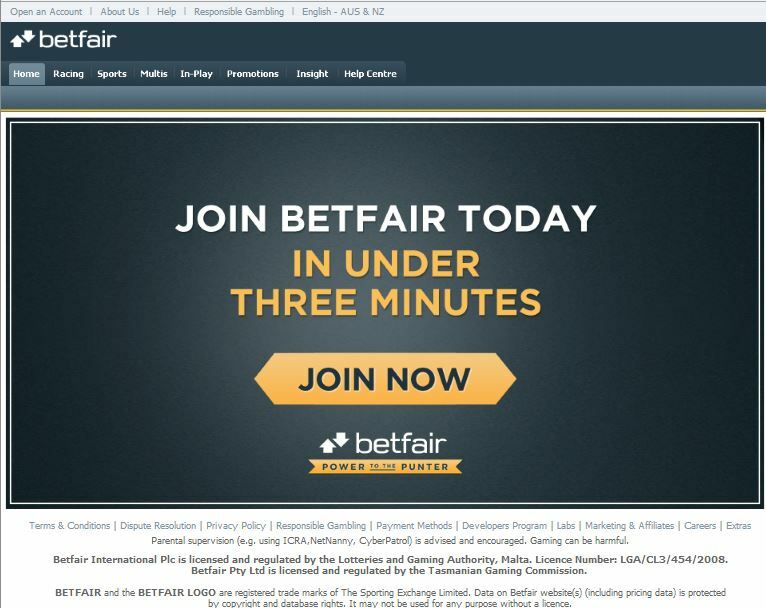 Owned and operated by Betfair International Plc (exchanging service) and Betfair Counterparty Services Limited (fixed odds service), thebetting exchange currently holds license in the UK (Gibraltar Gambling Commission), Malta (Lotteries and Gaming Authority), Austria, Germany and Tasmania (Tasmanian Gaming Commission) and are regulated accordingly through their respective authorities. Betfair is a unique betting environment because it operates as a marketplace. Members set the odds for an event and others take up those odds. This enables the user to act as both a punter and bookmaker. Unlike normal bookmakers all bets on Betfair are placed by users who either want to back a selection to win, or lay a selection to lose. Bulgaria, Israel, China, Hong Kong, Ivory Coast, Cuba, Japan, DR Congo, Lebanon, Eritrea, Libya, France, North Korea, Germany, Somalia, Greece, South Africa, Greenland, Sudan, Iran,Turkey, Iraq, USA. 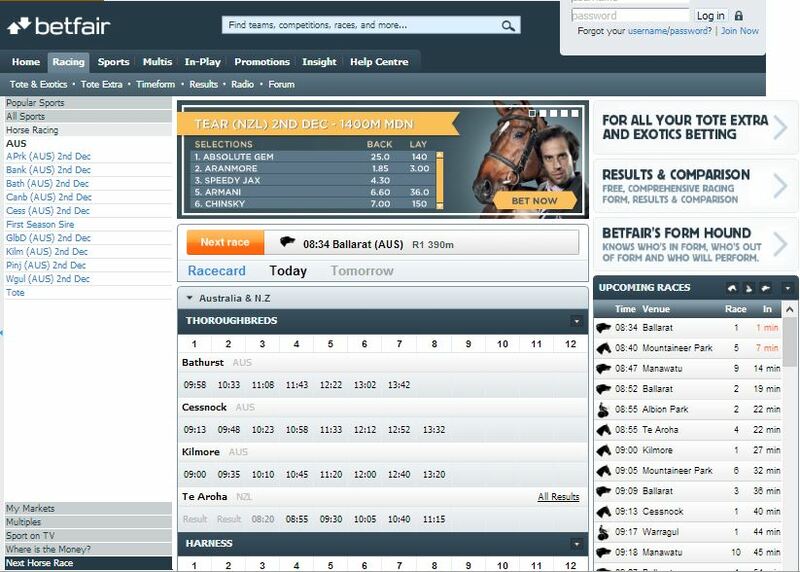 Betfair’s opening layout is full of useful and well-presented information. You won’t feel overwhelmed by any dazzling promotional graphics. What you will see is everything you need to get started finding your way around the site, presented in a subtle and user friendly manner with the intelligent sports gambler in mind. You can even change your opening home page depending upon your betting interests. The website is offered in various languages which is another example of Betfair catering customers worldwide. They offer their website in English, Bulgarian, Czech, Danish, German, Greek, Spanish, Finnish, Italian, Norwegian, Polish, Portuguese, Russian, Swedish, Turkish and Chinese. An aspect that many modern puntersmight not find appealing is the outdated look that the overall design seems to portray. However, when it comes to navigating around the site to check out sports and odds, it seems extremely flawless. Although the grey background might put some punters off and layout does not particularly look clean and visually attractive. The odds display can be confusing at first. Because you can bet for and against outcomes, both the back (bettingfor) and lay (betting against) odds are displayed for each selection. If you back a selection you are playing the role of the punter. If you lay a selection you are playing the role of the bookmaker. One thing that makes Betfair so inviting is their wide selection of sports to choose from. In fact it can be argued that they have got the widest selection of any bookmaker in the UK, Europe and even the world. The Betfair sportsbook and its wide range of sports betting options is second to none. When you click on the ‘sport’ tab at the top of the main interface, the left sidebar will appear where you will not only be able to search for the sport or league that interests you, but you will also find a list of both popular sports as well as the full list of sports available. Betfair is definitely known to be one of the most liquid online betting markets in the world. Betfair has all of your racing interests covered. Whether it’s racing in England and Ireland, racing in Australia or even the United States, race meets of every variety are available to bet on at every moment of the day, and it’s here where a great deal of the action in the Betfair betting exchange takes place. All of the major sports and leagues are catered for, and there are typically numerous betting markets for each AFL and NRL fixture. 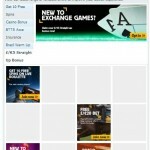 Apart from sporting events, Betfair also offers access to Casino, Live Casino, Poker, Arcade game, Bingo and numerous exchange games through its same website www.betfair.com. A lot of these sports have also got live in-sport betting, allowing the punter to bet whilst a game or race is in progress. At Betfair you are able to bet on something happening or even, something not happening. During a live event Betfair gives the punter the chance to swap or trade their bets. Unfortunately, due to Australian Law, Aussies are not allowed to place live bets online but they are allowed to place In-play bets through phone betting. Betfair also offers a well setup mobile application available in android, iPhone, iPad and Blackberry for mobile betting where you can even place live bets. Betfair believe that that they have odds that are a lot better and economical than other bookmakers. They have an approximation that their bets are 20 per cent better than most. On the other hand Betfair have a 5 per cent commission on all winning bets. Betfair have, for years, strived to be the best at with their steady rate of new customers, they could soon see them fulfil that ambition. Placing a bet is just like at any other bookmaker, except at Betfair you get to set the odds you wish to back or lay. To lay a bet is to back something not to happen. For example, to lay Collingwood to win their match is to back them NOT to win. If you were to lay them, you would win your bet if they either lost or drew their match. An aspect that many punters will surely be uncomfortable with, especially beginners is there is a high minimum bet, $5.00 for exchange wagering. Similarly, any bets through phone have to be a minimum amount of $20. Since betting with Betfair is different, it takes a bitof getting used to, but the website is well set up and it will only take minutes to get the hang of. 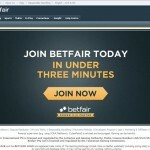 To many beginners, Betfair might not be as friendly as a standard bookmaker. Banking with Betfair is a breeze and there are many transaction methods available, with great online and phone help and speedy payments. Don’t worry about having to wait for your account balance to update following a win; it’ll be there ready to invest again in no time at all. The above deposit methods do not have any charges attached to them except for Debit or Credit Card deposits where the exchange charges 1.5% of the deposit amount. In terms of withdrawal, Australian players cannot transfer money from their Australian license wallet until you have confirmed your identity (KYC check). All players can only withdraw from the Main wallet therefore Australian players must first transfer then to the Main Wallet. In order to withdrawal, players from Australia or New Zealand need to verify their identity which can be done through an Australian Post Office. The minimum deposit for each deposit method is different. Some of the requirements are Debit/Credit Cards: $10, Skrill: $15, POLi: $5, BPay: $5, NAB: $5, Neteller: $25, Bank Transfer: $30. There are great bonuses whichappear as valuable option in the Betfair experience. 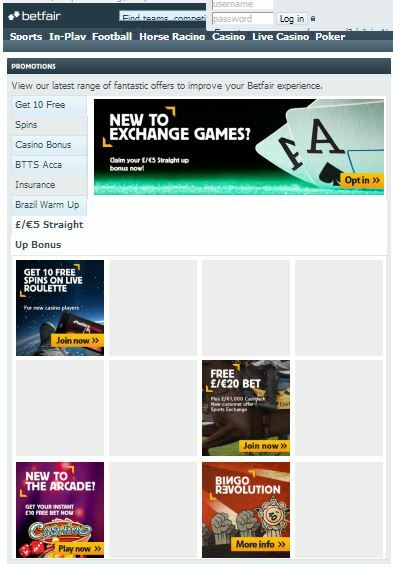 Along with great incentives for new members, Betfair provides a lot of new promotions for their existing customers. There are bonus offers available for new registered players for customers from Australia. Obviously various terms and conditions are attached to each bonus. For instance, for the first bet refund, the bet must be placed within 7 days of registration and is only liable up to a maximum of $200. All the above bonuses are exclusive to Australians or New Zealanders. 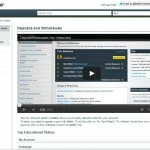 Customer support is also available as too are online tutorials on how to use the site. All the security and help you need is all on the Betfair website. 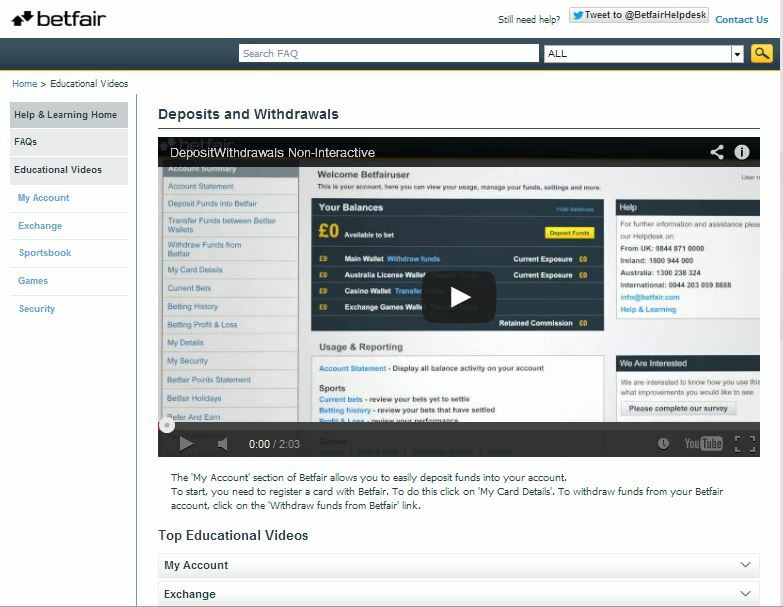 Betfair provides you with a detailed and searchable FAQ, where you can learn almost anything you need to know about how the betting exchange operates. If you can’t find what you need, then there are both email and phone help options available. You’ll find them easy to talk to and more than helpful with any issue you may while at Betfair. English, Bulgarian, Czech, Danish, German, Greek, Spanish, Finnish, Italian, Norwegian, Polish, Portuguese, Russian, Swedish, Turkish and Chinese.